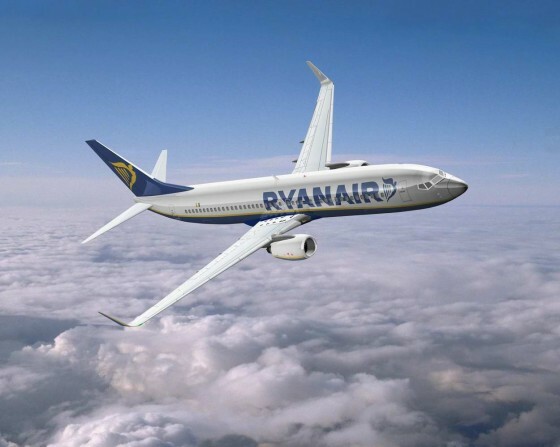 Last Wednesday, 10th February 2010, Ryanair chief executive Michael O’Leary announced the company was to build a second maintenance hangar at Prestwick Airport, creating up to 200 new jobs. As the BBC reported, The £8m investment, supported by £1.5m from the Scottish government, would see both facilities service Ryanair’s fleet of more than 200 aircraft. The story caused barely a ripple in Ireland on the day, but since then, it has emerged that jobs could have been created in Dublin. Ryanair – and Michael O’Leary – have dominated the headlines. A variety of political and media commentators have highlighted this as yet another PR masterclass by O’Leary and Team Ryanair. It’s rare that a week passes when Ryanair do not feature prominently in the news. Over the last 12 months, what has Ryanair’s media presence been like, online? What are the key stories that the airline has promoted, and what gets reported? O’Leary Analytics has taken the coverage the low fares airline has received over the last year in the online media and picked out the key trends and topics. To what extent does Ryanair set it’s own agenda in the media? To analyse this, we need to look at the coverage Ryanair has generated over a period of time and see if there are any significant peaks. 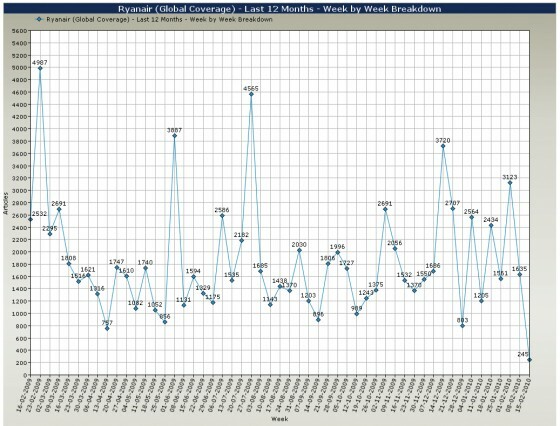 The graph below is a weekly breakdown of the coverage Ryanair has received globally over the past 12 months. During this time period, there were five weeks when over 3,000 news articles were published mentioning Ryanair. By cross-referencing these peaks with siginficant Ryanair stories at the time, a clearer picture of their PR campaign, and it’s success, can be seen. 23rd February 2009: The announcement that Ryanair planned to close all check in desks by 2010 led to a serious spike in coverage with almost 5,000 articles being published this week. 1st June 2009: Charging a pound to spend a penny – What had begun as a PR stunt earlier in the year, quickly turned into yet another media frenzy as Ryanair confirmed plans to charge passengers to use the toilet on their flights. Over 3,800 articles appeared worldwide this week as the media latched onto the story. 27th July 2009: The announcement of Q1 Results. What should have been very much a bad news story – falling share prices following a revised profit announcement – was turned into a positive story by announcing that fares could fall by more than 20% this summer. 14th December 2009: Ryanair announces it is cutting its order for Boeing aircraft in half. O’Leary says surplus cash would be returned to investors. His statement resulted in the share price gaining 6.5 per cent in Dublin. 8th February 2010. A date the Irish government will want to forget – Michael O’Leary announces the creation of up to 200 new jobs at Prestwick Airport in Scotland. Days later, it emerged he could have created 500 jobs in Dublin had the Government acted as an intermediary in negotiations with the Dublin Airport Authority. This story continues, and the coverage Ryanair receives will only increase. So, how does Ryanair stack up against its competitors in the PR stakes? 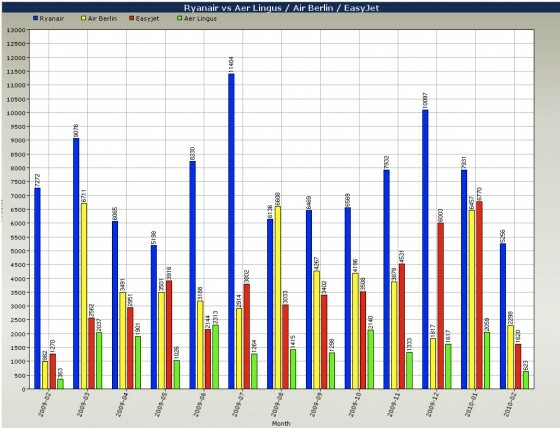 O’Leary Analytics compared the coverage of four low-fares or budget airlines in Europe received over the last 12 months – namely Ryanair (blue), Aer Lingus (green), Air Berlin (Yellow) and EasyJet (Red). The results back up the theory that Ryanair are well ahead in the battle for online column inches. The line graph below breaks down the coverage, month by month over the last year. In Ireland, Ryanair, and O’Leary in particular, enjoy a strong media profile. He has had many high profile confrontations with the government and various authorities. The airline routinely take out full page ads in Irish daily newspapers that poke fun at the government, and their competitors. Indeed, one competitor, easyJet founder Sir Stelios Haji-Ioannou, has decided enough is enough, and is to sue O’Leary. However, on a global scale, Ireland ranks fifth in the press coverage stakes. The United Kingdom is top of the list, with over 15,000 articles published in the UK over the last 12 months mentioning Ryanair. Germany are second, followed by the US, Spain and Ireland. And finally, when the coverage is broken down, what influence does Michael O’Leary really have? Like him or loath him, it is rare that we see a Ryanair story without his name all over it. And yet, in the context of overall mentions, his influence is limited. 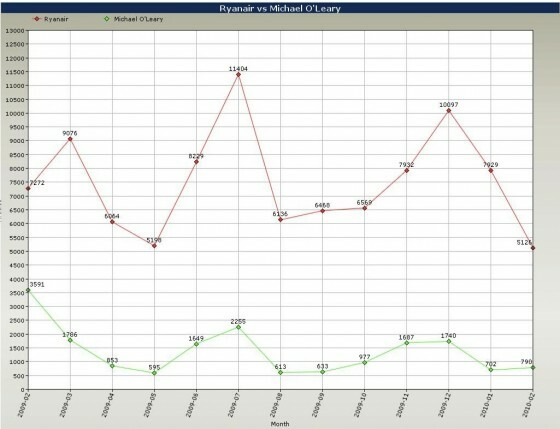 The line graph below compares the number of mentions Ryanair received over the last 12 months compared to Michael O’Leary. To ensure we got the right man, and not, for example, the Templederry Junior B Hurler of the same name we refined the search to articles mentioning Michael O’Leary and Ryanair, and compared that to mentions of Ryanair only. While O’Leary’s name appears regularly, it is clear Ryanair garners plenty of coverage without him. WHAT CAN WE TELL FROM THIS ANALYSIS? Ryanair, in the majority of cases, dictate their own media agenda. They generate far more column inches online than any of their competitors, most notably Aer Lingus. 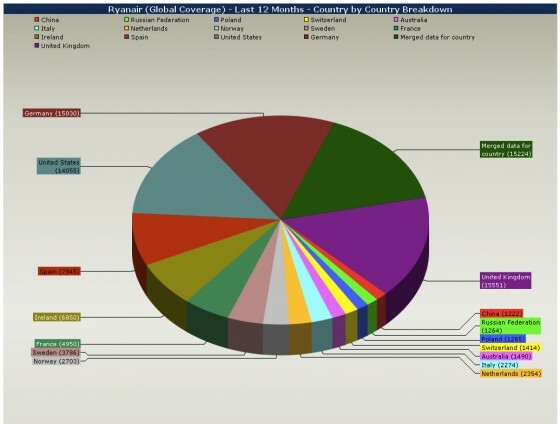 For an Irish company, they generated significant international coverage in the US, UK and Germany. Michael O’Leary, while popular, features in a limited number of total articles mentioning Ryanair. Be first to read the latest news and insights from the Olytico team.